Santorini is famous for many many things such as the volcano, the caldera, the sunset and so on. Some people might think that nightlife in Santorini is not one of them. There are many places on the island for you to enjoy your drink, loud or chillout, busy or quiet and of course super romantic ones (there are plenty of them, yes). But don’t think for a second that you will not find a place to your own liking. After an extensive “3 year research project” on the bars and clubs of the island, I proudly present to you a comprehensive guide for the nightlife in Santorini. Whether you are a couple looking for a romantic place to have a drink, a group of friends wanting to party all night long, or a solo traveller hoping to meet new people while on holidays, I’ve got you covered…! There is a place for each one of you on the following list. On this article you will find the Best Beach Bars, the Best Cocktail Bars, the most Romantic Bars and of course the Party Bars and Night Clubs of Santorini. Walking around Fira. High heels? Think again…. So…Let’s see the Best Bars and Clubs of Santorini shall we? Drink in hand, toes in sand.. Whether it is about a relaxing cocktail on a sunbed or a party on the beach, these Beach Bars in Santorini do it better. Scroll down and find your favourite one. I’d go there for: Great Cocktails and veggie food! Tranquilo is a lovely chill out bar right on the beach. Sunbeds are on one side and the bar is just across the street. Tranquilo is famous for its cocktails. I find their mojito to be the best one on the island. By far. They also have a great menu if you would like something to go with your cocktail. Or if you don’t drink cocktails and you just want something to eat. As a bonus, there are many vegetarian choices. Tranquilo has some amazing veggie plates…the perfect beach food! Tranquilo hosts bands and live shows every now and then. Do not miss their latin parties if you fancy dancing some salsa. This is literally the type of bar that you can spend a whole day. Jojo Beach Bar epic entrance…! JOJO is one of the most famous beach bars in Santorini, especially known for the parties they host so be sure to check what is on when you visit. With a beautiful relaxed setting, you can choose the sunbeds on the beach or the pool area across the street. In the pool area is where parties take place. Loud tunes, big swimming pool, big crowds. Yes…people in Jojo do party! If you are after a good party in the afternoon, this is just the right place for you. Keep in mind, the parties usually end at around 23.00-24.00. If you prefer a quiet place by the beach, you can also go to JOJO and get yourself into a lovely cabana on the beach. Cabana, cocktail in hand, the sea right in front of you.. Enjoy your day! Wet Stories is another one of the famous beach bars in Santorini. There are lounge chairs, sunbeds and giant bean bags you can choose from to chill out on the beach. You can also play beach volley or you can go to the bar across the streets if you want to party. Wet Stories is also good if you are looking to eat something on the beach. Gets louder in the afternoon, especially when there is a guest Dj or a live show. The cocktails will not disappoint you. As a bonus, I quite like that every umbrella has an electric charging point for mobile phones and a small safe to put your things inside when you go for a swim. Chilli Beach Bar was renovated in 2016 and is now a relaxing bar/restaurant on the beach. The atmosphere is lovely, the food is great and the staff very very friendly. Every now and then, they do a full on Greek bbq, so if you happen to pass outside, follow your nose and join the fiesta. Chilli is right next to Wave Sports, so you could go for a drink after your jet ski ride. You will discover a very interesting cocktail list. It will surely intrigue you. Try their own “Hot Chilli” cocktail. Refreshing and spicy. Love it! Seaside by Notos is a restaurant, but it had to be on this list simply because it has a super romantic setting for you to enjoy and also because they make amazing cocktails. They update their cocktail list every year, but for sure you can find something you like on there. Plus you can enjoy it on a huge lounge chair by the sea. Perfect place if you want to start off your night with something quiet. Also super romantic in the evening, which makes it an ideal place for a date away from all the crowds. You can call in advance to book your sunbed/ table. You can also arrange for a private dinner right on the beach, just for the two of you. At Seaside by Notos you can arrange a private night on the beach for you and…the other half! Theros Wave Bar is tucked away into the white volcanic cliffs of Vlychada Beach (a.k.a. white beach) and cut off from civilization. It really offers a small taste of paradise on earth – here in Santorini and it is worth discovering it. Theros Wave Bar is just so exotic. I really think Theros Wave Bar was specifically designed for couples and super romantic occasions. You can eat and drink here. You can even get married here! Try their “Honey Spirit” Cocktail. I’d go there for: the experience and the great cocktails! 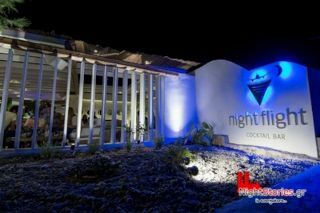 Night Flight Beach Cocktail Bar is a new addition to Santorini’s nightlife. It is perfect if you are looking to get away from the busy towns. It is situated very close to the airport and the whole concept is based around it. What is cool about the Night Flight is that planes pass literally just above your head. There is an open air roof so if you look up, you will see them. In every landing, the lights go off and the music is turned down, so you can enjoy the… “night flight”. Apart from that, the bar is lovely decorated, cocktails are amazing and there is a nice relaxing feeling to everything. Just before you call it a night, have a walk on the beach, it is a very very romantic setting. MoMix first opened in Athens and you can now find it in Santorini as well. Last time I was there, I did shots on a spoon and in a green jelly form. Looking at George – the barman- cook up my cocktail made me feel like I was back at school, attending a chemistry lesson- without my lab coat. I absolutely hated chemistry, but somehow I quite love these molecular cocktails. Momix’s magic filters: a.k.a out-of-this-world cocktails! 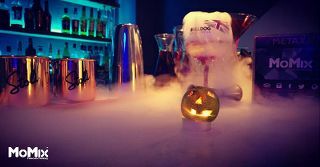 Molecular cocktails at their best! Besides the funky cocktails MoMix is also big on electronic tunes, so if this is your thing you are in for a great night out. Casablanca is a lounge cocktail bar in Fira. A bit unappreciated if you ask me. This is a great choice if you are looking to hang out with friends. The setting is relaxing, the balcony adds a bit of romance to the spice and the focus is on the music. Here you will enjoy house, funk and soul vibes. They bring in very big names when it comes to DJs. If you don’t know this place, it is really worth discovering it and going for a drink. Casablanca Cocktail Bar was actually voted one of Europe’s Best Bars by Guardian. You can read about it here. This list is designed for you love birds looking for a romantic place to have a drink and for you looking for a place to take your date. Trust me, Santorini is home to some of the most romantic spots around and these bars will not disappoint you. Lioyerma Pool Bar is on the northern tip of Oia, right after the windmills. “Lioyerma” means “sunset” in Greek. This place was named after sunset for a good reason: because it is really the best place to watch the sunset in Santorini. In an idyllic setting, around the swimming pool, you can get a drink and enjoy the amazing views. One of my favourite places in Oia, I find Lioyerma to be so romantic and chilled. Perfect ending to any good day or the best way to turn around a bad day. Do you need any other proof that Lioyerma Bar is super romantic…? Palia Kameni is a cocktail bar situated right opposite of the volcano . It offers amazing views to the caldera and the town of Fira. Palia Kameni Bar is ideal for a coffee throughout the day or a cocktail during the sunset. With a chilled playlist, their signature cocktails and an impeccable service, this place will make your Santorini sunsets extra special and your date super romantic. You can book a table online, just to make sure you get front row seats! I’d go there for: the Homemade sangria! Kira Thira Jazz Bar is a small cozy bar right in the heart of Fira. It has been there since 1976, so it is the oldest one on the island and definitely older than me! Kira Thira is a grown up bar with style. This is a great place to bring a date. There are only a couple of tables and a few bar stools, so you can sit and sip. The music is not just jazz, it is actually for all tastes and all ages. They have such a huge cd collection. As a bonus, in Kira Thira you will find amazing homemade sangria. They know it is good and they brag about it. You should try it. It rocks! 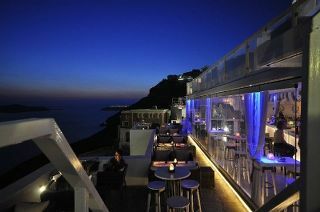 Crystal is a lounge bar with stunning views over the caldera, the volcano and the town of Fira. The scenery is truly amazing, which makes Crystal a great place to watch the sunset from. Bring your date or just come with your friends if you are looking for a quiet night. The music is not too loud, so you can sit down and have a chat. Get a “Volcano” cocktail and enjoy the view of the actual volcano right in front of you. Crystal is relaxing and romantic. 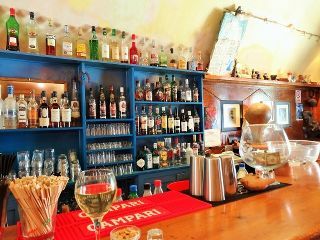 Plus it offers a great selection of drinks to choose from. Franco’s Bar is right on the edge of the cliff of Fira, probably in the very best spot and thus offers a spectacular panoramic caldera view. If you are a fan of classical music, this place is the right one for you. It is the only one in Santorini where you can enjoy the sunset while listening to Chopin, Vivaldi or Maria Callas. There is also a “Maria Callas Champagne Cocktail” to go with that. Classical music and opera on lounge comfy chairs…that’s Franco’s. Franco’s is not only views and opera music. 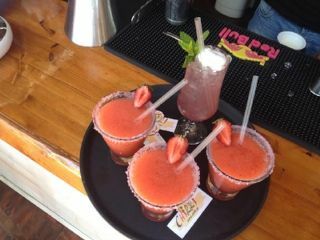 The cocktails are yummy too! In addition, Franco’s has comfy lounge chairs where you can lay back and enjoy your drinks. There is a great wine list to choose from and some small “meze” plates to accompany your drink. Tango is a lounge bar in Fira, right next to Franco’s . Same amazing views to the volcano and the cliffside, plus a good vibe and a great ambience. 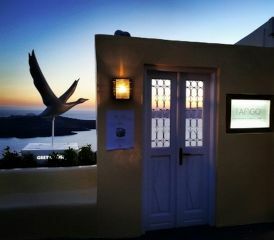 Tango starts off with lounge and chillout music, which is a perfect match for the sunset in Santorini. After the sun goes down, the music gets louder and funkier with deep house tracks. The party keeps going all night long. They do not serve food here, but you will enjoy amazing cocktails. There are only nine tables, so it would be wise to reserve one. Mylos is a bar restaurant in Firostefani. “Mylos” stands for “windmill” in greek and this bar is actually housed inside an old windmill perched on the edge of the cliff. Upscale, a very classy bar with stunning views, Mylos is a great place to bring your date. You can also enjoy fine dining here and some very very special desserts. I usually go for the “Chocolate Painting” and then a foamy mojito (yes, I do like my mojitos). Santorini is considered a romantic destination, but that does not mean that you cannot have a good time if you are single, travelling alone or with friends. There are some awesome party bars in Fira, just for you! There are basically 4 great Party Bars in Fira, Santorini. These are more casual – Perfect for you and your friends, for a big night out and for solo travellers as well. I’d go there for: the shisha! Two Brothers is a party bar/night club at Fira. It has been there since 1983 and I really feel like I should be writing a separate post about this place. This is such a fun bar/club – one of my personal favourites. There is no attitude, no posh front. Prices are good, there is a happy hour and you can also do “head shots”. Head shots were invented by Jack- the owner. It involves you wearing a helmet and someone from the staff (usually that someone is Fotis) hitting you on the head with a baseball bat ! Then, you get a free shot. And possibly a headache…I haven’t tried that. Yet. Dj Alex sure likes his r&b tunes, so be ready to drop it like it’s hot. You will probably see me somewhere in there as well. As a bonus, it is one of the few places on the island where you can get a shisha. You can also celebrate Halloween there. There is a legendary Halloween party every year! I’d go there for: the Sports! Murphy’s Bar and Saloon has two levels. Starting from the bottom at the Saloon, you can enjoy a game of pool and a great variety of drinks and beers that you don’t find anywhere else on the island. I go there to enjoy my favourite Newcastle Brown Ale (huge fan!). Vaggelis is behind the bar and he knows his drinks. If you are not sure what to get, he will help you. The lower level is more of a rock bar and they do live shows as well, once a week. Upstairs you will find a mainstream bar, busy will people from all around the world. As a bonus, if you are a sports fan, you can come to Murphy’s to watch your team play. As an extra bonus, on a night out here you can also practice your pole dancing skills. This is a great party bar in Santorini. The Highlander is the only Scottish Bar in Santorini. During daytime, there are two large TV screens streaming all sporting games and tournaments you might want to catch. 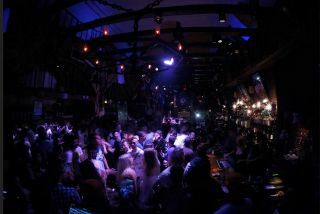 At night, Highlander transforms into an international cool bar with great music and a party atmosphere. Perfect place to come, have a drink, dance and meet fellow travellers. Tropical is a lovely small bar in Fira, overlooking the caldera. Super friendly feel, cool people and good cocktails make Tropical a great place to be. The balcony offers amazing views to the volcano and a romantic feel. The tunes inside will put you in a party mood and the cocktails will perfectly top up the feeling. They do happy hour here as well. If you enjoy latin music, this is the best place for you. There hasn’t been a time where I went to Tropical without salsa-ing a bit and this is exactly why I love it ! Keep in Mind: Bar Hopping Is A Must! These four party bars are rather small and tend to be packed sometimes (especially during the High Season for Santorini). But that always changes throughout the night. Walk around – these are all very close to each other, see what is happening inside and choose the one you prefer depending on your mood and the crowds. Same bar that is empty/dead at 11-12 might be full an hour later. And vice versa. See which one suits you the best! If you are on a big night out, but you don’t like small crowded bars and would like something a bit more spacious and classy, then you can head a bit up the road and choose between Enigma Club and Koo Club : the two big nightclubs of Santorini. These are perfect for a group of friends or a couple looking to dance away the night. You might need to dress up a bit for these two. Further up the same street you will find the greek club “Mamounia”. Enigma Club re-opened in 2016. It is a big, fancy club housed in a cave room in Fira, with an impressive architecture. Enigma is all about electronic and house music, but they do host events with guest DJs to spice things up, so there are some hip hop nights and also some Greek ones. There is also a patio outside if you want to enjoy your drink there. Enigma is one of the few places that stay open in the winter (low season) – weekends only. This is why it is a popular place for locals to hang out. 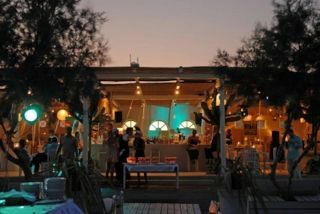 And enjoy the outside area as well..
Koo is probably the most famous nightclub in Santorini. It has three bars outside and one inside. The dance floor is inside and is usually packed. If you fancy a dance, go inside. If you are in a more romantic mood or just prefer to party under the stars, the tropical setting on the patio outside will fascinate you. You can move the party there, or just relax on a sofa under the palm trees and have a drink. The music varies from electronic to r&b to Greek at the end of the night (or early morning hours) so it will match your taste at some point. I have never met a single person who did not like Koo Club. 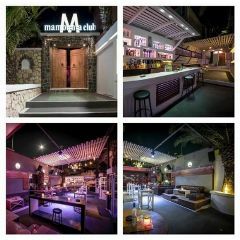 Mamounia is a large Greek club with indoor and outdoor spaces. The music is purely Greek and the crowds are mainly locals. Here you can get a taste of a Greek night out. Do you know how to dance “Tsifteteli”? Come here and you will become an expert overnight. If you plan on going, you have to do it the Greek way. So basically, don’t go before 1am. If you do go it will probably be empty. The party doesn’t stop until the sun comes up. Next time I go, I should remember to bring my sunglasses with me. If you are not a big fan of Greek music chances are you won’t know any of the songs but it can be really fun! After a night out in Fira, you will be hungry….like really hungry. Head down to the main square in Fira for a slice of pizza, a gyros or… (I saved the best one for last) go to the famous “Svoronos” local Bakery! It is right next to McDonald’s and it is open 24/7. Here is Svoronos Bakery on Google Maps. 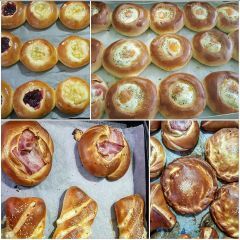 Sweets, pastries, handmade sourdough pizzas, savoury treats, sandwiches, you name it! Svoronos Bakery will have it and it will be super tasty! You can’t find that at home! Svoronos Bakery at Fira is 24/7 open in high season and it is the best after drinks food you can have! Bars usually close at around 2.30-3.00am. Beach bars will close before that- at around midnight. Nightclubs will stay open until early morning hours. However, all places adjust their closing times based on the crowds, so basically when busy they tend to stay open later. The streets in Fira are all cobbled, with a few steps every now then, which makes it very hard to walk in high heels. Unless you have a really good balance, I would avoid wearing high heels or at least go for a wedge or any sort of thicker heel. Some places tend to be quite expensive, so make sure to check the prices before ordering. Also if you plan on paying by card, keep in mind that some places only accept cash. Last but not least – and I really hate to sound like your mom- you should always be careful with what you are drinking on a night out. Santorini is generally a safe place, but still. I prefer drinks that I open myself, like a beer. This also works out cheaper. Win win. If you are visiting Santorini for the nightlife, the Best Place to Stay is in Fira. Most of the nightlife is in Fira. As you read on this article, the Best Party Bars and Nightclubs are in Fira, so this will save you time and money going back and forth to your hotel. Buses do not run at night, so you can only take a taxi (by the way you will be needing cash for you taxi ride as well). If you stay in Fira, you can go out and then just walk back to your hotel. . Win win again! That is all you will need to know about nightlife in Santorini. You now have more than enough choices to go out for a drink in Santorini. In Fira, in Oia and/or on the black sand beach. All you have to do is decide what you are in the mood for. Or just try a few of these places while you are there. This is how we say “Cheers” in greek. It will come in handy to know this when you get to Santorini. Is there any place I’ve missed? Happy to help you plan a great night out in Santorini- ask anything you want! Hope this list will help you have a great night! Have fun! This article was first published on SantoriniSecrets.